On Saturday night, I was cooking for myself and pretty much at a loss for what to make. Easter dinner was all planned (more about that in a future post), but the night before was a blank slate. I had a craving for vegan sausage, but a sausage sandwich sounded too plain. In the end, I wound up throwing this together with various veggies we had around the house, and it came out pretty darn good! I used Organicville Tangy BBQ Sauce, but you can use any barbecue sauce that you like (Veganomicon has a great recipe). Try different varieties for different barbecue flavors! 1) Bring a large saucepan of water to a boil. Add the garlic, potatoes, and collards. Return to a boil and cook until the potatoes are tender, 15-20 minutes. If you’re using kale, you may want to wait to add it until the potatoes have been cooking for 10 minutes or so. Remove from heat, drain, and set aside. 2) Meanwhile, heat a large nonstick skillet over medium-high heat. Cook the sausage slices, turning frequently, until brown on both sides. Remove from the skillet and set aside. 3) Turn the heat down to medium and add the onions and bell peppers to the same skillet. Spray with a little cooking spray if desired. 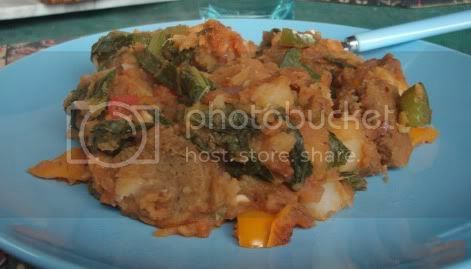 Cover and cook until softened, about 5 minutes, stirring frequently to prevent burning. 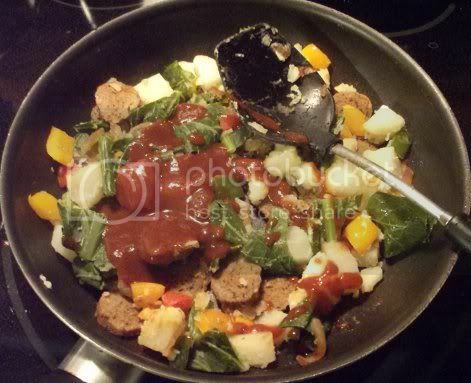 4) Add the reserved potatoes, collards, and sausage slices to the skillet. Spray with a bit more cooking spray if desired. Add the barbecue sauce and black pepper to taste, stirring to coat. Continue to cook, stirring, until heated through. Serve hot.